This drawing-and-painting-focused retreat will weave meditation techniques and forest meanderings into the art process. 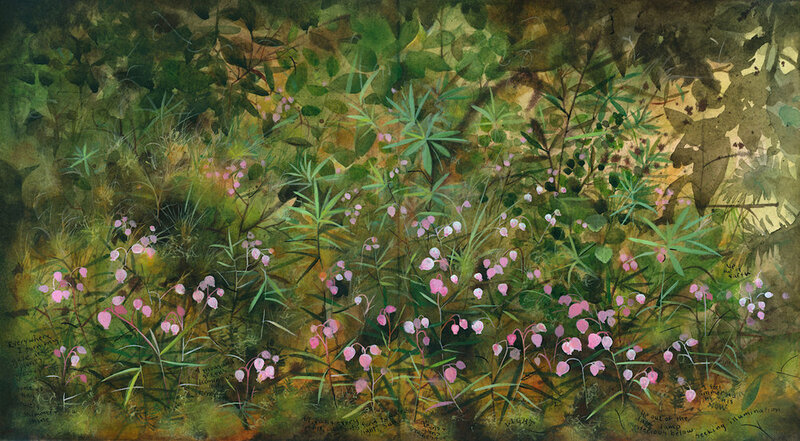 Our practice will include technologies of painting with watercolor in the outdoors, drawing to capture tree and plant gestures, recording field notes, painting in layers to conjure up wild complexities, and quieting creative anxieties. We’ll bring mindfulness to each moment, every leaf we sketch, each wild mark and brushstroke, in the creation of a series of mixed media paintings using watercolor, gouache, and ink. As the spirit of the forest sinks into us, encouraging us to let go of attachment to outcome, our work in TreeSong’s enchanted forest will reveal new depth and magic. Participants may arrive anywhere between 3:00 and 5:00 pm on Friday. Dinner Friday night will be a potluck. The remaining meals, breakfast, lunch and dinner on Saturday, breakfast and lunch on Sunday, will be prepared for you. The retreat will draw to a close at 3:00 pm on Sunday. Art supply list is below (scroll down). Best for those with prior watercolor experience, but all levels are invited. Students may provide all their own art supplies as listed here, or purchase a complete kit of all supplies to keep for future work. Cost is $80, and must be ordered at least 30 days before the retreat. 2 full-size sheets 140 lb. hot press and/or cold press watercolor paper (Arches or Fabriano are recommended. Buy the best you can afford. Student-grade papers will not work as nicely as better papers will.) Cut or tear your sheets into six equal pieces measuring approximately 10 X 11 inches before coming to our workshop. One full-size sheet of watercolor paper (22 x 30 inches), will yield six 10 X 11-inch pieces. You must do this before coming to class—we will not have the space or tools on site! OR, if you prefer to work in a field journal format, that is OK, too. If so, be sure your journal holds watercolor paper in any size you like (journals at least 8 inches on one side are easier to handle). It is important that your journal stay open and flat, so you are able to work across both pages with ease. Brands that make good watercolor journals include: Stillman & Birns sketchbooks (Beta or Zeta series) , Pentalic Aqua Journal, Winsor & Newton Professional Watercolor Journal, Strathmore Softcover or Hardcover 400 Series Watercolor Art Journal, Fabriano Hardcover Watercolor Journal, Global Art Materials Travelogue Watercolor Book, and Moleskine Watercolor Notebooks. Clipboard, foam board, or other lightweight board approx. 12 x 12 inches, with 2 clips big enough to hold your paper or opened journal to the board. 3 or 4 colored pencils in any colors you like - with at least 2 light colors. Prismacolor "Cream" is a helpful color to have. #10 or #12 and #6 round watercolor brushes. Winsor & Newton sable or synthetic brushes (Cotman, Cirrus, Septre Gold, or Series 7), or any other brushes you like, are also good. Creative Mark “Rhapsody” round watercolor brushes are an especially good deal for a very nice brush. It will pay off over time to buy the best brush you can afford!